Whether you are hopping into the looking glass or diving down the rabbit hole, everyone knows that Wonderland is filled with every single type of person you can imagine and a good number that you couldn’t. The population is so whacky that nobody can be prepared, but there are a few easy guidelines that will help you move around the world without getting into too much trouble. First, don’t eat or drink anything just because it is labeled and asks you to do so! Second, if you see floating smiles or purple cat parts that aren’t clearly connected to any creature, it is probably best to just hide. That Cheshire Cat can be a real kookie character. But the most crucial detail of all: do not let the Mad Hatter take off that hat! There is pure crazy inside the Hatter and the only way to keep things under wraps is to keep that hat on that head! Just in case you might happen to have a wild and crazy kid on your hands, we have a few extra in store just in case you need to put a lid on the nuts! 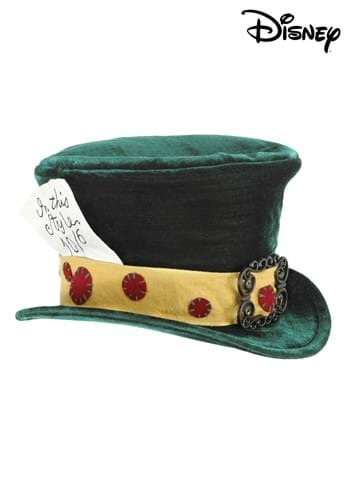 Do so easily with this Child’s Mad Hatter Hat. The yellow banded green hat is iconic, adjustable, and has an interior pocket for easy storage. But, it also is almost guaranteed to ensure that your tyke won’t turn into a complete mad man. Almost. Probably. A little bit guaranteed… we hope. Your kid will look great, though. That we can promise!